On Saturday night, 160 eager fundraisers gave up their warm homes for a cold and wet night under the stars so that older people don’t have to suffer the cold. The Big Sleep is an annual event organised by the Foundation to raise money for their Winter Warmth Appeal, which supports older people in Cumbria who struggle to pay their heating and fuel bills in the winter months. This year, the refurbishment of the Low Wood Bay Resort Hotel gave campers the unique opportunity to sleep right beside the lake rather than on the hill behind the hotel. 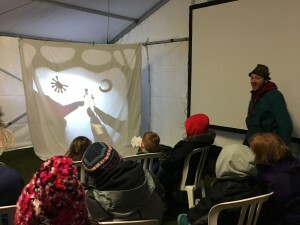 Little Sleepers enjoyed shadow puppetry with storyteller Ian Douglas and there was a family movie and live music from the Sessionistas, and JC & the Moonshine band. Calderwood House kept campers warm with their speciality coffee and English Lakes Hotels provided the evening meal and breakfast rolls in the morning. 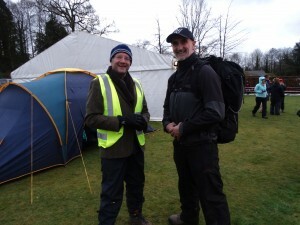 Andy Beeforth, Chief Executive of the charity, said: “We couldn’t be happier with the number of people that turned out to support the Big Sleep. Our campers have so far raised more than £15,000 and this money will make a huge difference enabling us to continue our work, helping older people within our community. The appeal has already distributed £120,000 this winter to help older people heat their homes during the colder weather. Sian Whittlemore, of Ulverston, took part with her partner Paul Baxendale and their three children Iona, six, Izak, nine, and Owen, 13. 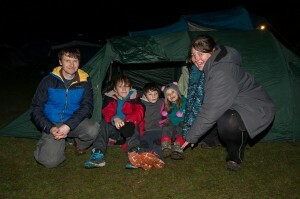 Sian said: “The kids absolutely love the idea of camping out in the cold and having a laugh throughout the night. It’s something that we really enjoy doing together as a family. Also braving the cold was Dave Henderson, Business Manager at Cumbria Nuclear Solutions Ltd. He said: “We are pleased to be supporting such a worthy cause. This is our first year here but it won’t be our last. There is a great atmosphere and everyone has a smile which is great. You can still donate towards the Winter Warmth Appeal. 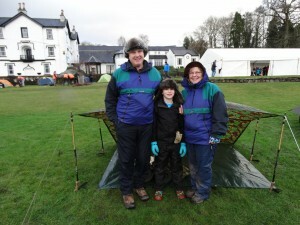 Visit http://www.cumbriafoundation.org/winter-warmth-fund/give-to-the-winter-warmth-fund or phone 01900 825760. You can also send a text message to 70070 including the code WINT37. You can donate £2, £5 or £10. e.g. WINT37 £5 to 70070. Or you can send a cheque to: ‘Cumbria Community Foundation’ and write ‘Winter Warmth’ on the back. Send it to: Cumbria Community Foundation, Dovenby Hall, Dovenby, Cockermouth, Cumbria, CA13 0PN.